Ketenes commonly known as ethonone is organic compound, are colorless, unsaturated ketones and are highly reactive in nature, and hence are not stored or shipped in gaseous state. Ketene cannot be isolated and stored and hence are used for captive consumption. Globally, growing environmental concerns including huge carbon emissions, rise in the demand for chemotherapy, and increasing anhydride and diketene market are the prime growth drivers of global ketene and ketone market. In addition, increase in adoption of ketene and ketone for newer applications, and emerging economies such as China, India and others, will create new opportunities for global ketene and ketone market. 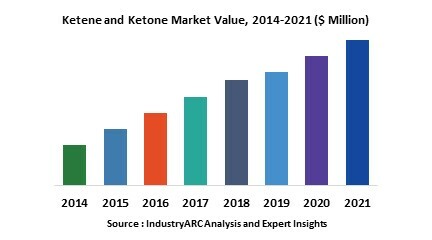 However, higher cost of the research and development, stringent environmental regulations, and hazardous side effects to health are the key restraints for global ketene and ketone market. This report identifies the global ketene and ketone market size in for the year 2014-2016, and forecast of the same for year 2021. It also highlights the potential growth opportunities in the coming years, while also reviewing the market drivers, restraints, growth indicators, challenges, market dynamics, competitive landscape, and other key aspects with respect to global ketene and ketone market. Geographically North America dominated global ketene and ketone market, and Asia Pacific is projected to have fastest growth, owing to rapidly increasing aging population, and modernizing healthcare infrastructure in this region. Among all the end-users, industrial segment has the highest market share in global ketene and ketone market. Prototype & Plastic Mold Co. Inc.
13.4. Prototype & Plastic Mold Co. Inc.